Last year you may have read my review on the Yokohama Geolander GO15 AT tyre. I’ve attached the web address below if you haven’t, and would like to see how the tyres performed in the Simpson Desert, Red Centre and the Kimberley regions. This year my travels take me to the northern most point of Australia, and some of the most beautiful scenery this awesome country of ours has to offer. This time I was taking a camper trailer and my two kids, Zoran 7, Katija 6. Yokohama have developed another tyre for us to test out. The Geolander MT 003. Again I was privileged enough to be asked to test these new tyres out on some very tough conditions. Traveling with friends is always better than traveling solo. Kelly and her partner Marty (you may remember them from last year’s trip. They drove to Ayers Rock to meet up with us for a few days), were travelling up from Melbourne to tackle the Cape with me. They too were given an opportunity to test out Yokohama’s brand new MT. The Tyres were airfreighted directly from Japan just in time to have them fitted up at Bob Jane in Rockhampton before our trip. As Kelly and Marty drove up from Somerville in Victoria in their luxurious Ti-L Y62 Patrol, they had a break in Rocky with me before we headed north. Travelling up the coast to the Daintree was relatively uneventful, and while there were some lovely spots to stop and look out, our goal was to get off the tar and onto the dirt as soon as possible. The “Troll” towed the camper effortlessly, and I was surprised the very aggressive GO003’s weren’t noisier. They handled the bitumen very well, and while I certainly wouldn’t say they drive as good as the GO15 AT tyres, they performed admirably for a mud terrain. We stopped at Townsville to meet up with Jono (from last year’s Simmo trip) and his lovely family for a BBQ. Kelly being our gourmet cook just couldn’t leave Jono to manage the BBQ on his own! We had a two night stop at Cairns to have a final look over everything, get some supplies that might not be so easy to get further north, and catch up with James (James also crossed the Simmo with me in 2016). James was also travelling to the Cape with his family in a 4 car convoy. Their trip would see us meet up at a couple of locations but otherwise our travels kept us going in different directions. A very important note to add here, is the importance to check your vehicle and equipment regularly on your travels. 1st, the Aux battery in the camper wasn’t holding charge. So I had it tested at Battery World in Cairns and had to have it replaced under warranty. 2nd, I thought it prudent to get a second set of bearings for the camper. I’m not that mechanically minded, and I decided not to trust myself and had the camper looked over. Lucky for me, I did.The chain that holds the independent suspension from overextending was not connected. The bearings had a little too much play in them as well. So the awesome guys at Warpac Towbars & Trailers were the only guys in town that would look at the trailer straight away. $250 later they repacked the bearings, fixed the chains and supplied me with some grease and spares. A small price to pay. So, camper sorted, supplies stocked up and we headed to lovely Daintree River and across the ferry to camp at Cape Tribulation Camping ground. It didn’t take long to go from “chilling” to “lights out”! What a beautiful spot to stay, just off the beach. We stayed a couple nights at Cape Tribulation as we wanted to tackle the famous “Creb Track”. And as it had only been opened a few days before we arrived we were strongly persuaded not to attempt it with the camper. To be honest, I was a little disappointed with the Creb. After all the stories, I expected it to be a bit more challenging for us and the vehicles. With some magnificent views, steep climbs and descents, it was a very pleasant drive, but not at all challenging for the Patrols. (Maybe it was the tyres  they certainly didn’t have to work very hard today). Had the tracks been wet, it would be totally different story and I could understand why they close that track off during the rains. Moving slowly north we travelled the Bloomfield track to the Bloomfield Falls. The Bloomfield track isn’t what I remembered of it. I travelled it nearly 20 years ago, and it was certainly challenging. Now it’s basically a very well maintained dirt road, with some very steep hills to go up and down. And certainly no need for a 4x4. I would caution some common sense in the wet season, but I believe it’s all closed up when the rains hit. 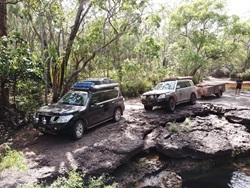 Continuing our journey we headed to Weipa after camping at places like Kalpowa and Chilli Beach. Weipa was not what I expected. To be honest. I don’t know what I expected. But I really didn’t know it was just a mining town. If you read my previous review, you will know I chased the elusive Barra all over the Kimberley. And nothing.. Would far North Qld finally bag me one? We met up with James and his convoy at Weipa and stayed a few days to relax, fish and see the sights, and fish, and relax, oh and fish…. Fish… Fish… well I wasn’t allowed to stay any longer, Kelly the ever organised and fastidious planner had us on a tight schedule. No Barra! But hey what a compromise. 3 of these babies all over 85cm (Threadfin Salmon, and the biggest @ 112cm long). I loved Weipa, the little red mining town. We visited some local beaches and fished every night. We spotted our first croc in the river. Well fishing was over in that spot haha. FINALLY!!!! 83cm of AWESOME!!!. Yes I was a little excited catching my first Barra. The kids loved it, some fresh fish and chips. I know, I know.. This is supposed to be a tyre review.. I know some of you would appreciate the fishing and hey, we are allowed to brag..
Onwards and upwards we went. Next.... The OTT (Old Telegraph Track)..
After hearing all the stories, seeing all the videos and photos from so many people travelling up here, I couldn’t wait to tackle it. And tackle it we did. Palm Creek was the most challenging. These tyres were just awesome. The camper… not so much.. The camper trailer was a hindrance on the OTT, I had to constantly find chicken tracks because it just didn’t have the clearance. And kept getting stuck. Damage to my car was caused when the camper got stuck and pulled the car into the side of creek bed. Off-road camper, maybe.. But 4x4 Camper, it was not. These were the conditions these tyres were made for, rough tracks, water crossings, mud. It handled everything we threw at them with easy. My car has a few modifications, 35” tyres, BP-51 2” lift suspension and the bar work. Kelly’s Y62 is pretty much stock. Only Slightly bigger tyres then stock, no lift, and only a bulbar. Her vehicle made easy work of the creek crossings and rutted tracks. So you could clearly see how effective the G003’s really were on her car. Lots of creeks to cross, some with well-constructed bridges. There really wasn’t anything overly challenging on the OTT. Aside from Palm Creek, the rest was easy, though the camper still copped a couple of bumps and scrapes. The tyres just gave us that extra confidence that we could make it through anything that looked tricky; No punctures, not chunking, the tyres handled this with ease. Remember, always adjust your tyre pressure to your situation. While I dropped pressures down 25 psi, front and 30psi rear to accommodate the heavier load of the camper, Kelly ran 20-25psi all round depending on terrain. Sand 20psi, dirt and corrugations 25psi. This not only helps with protecting the tyre from damage, but also increases the tyres footprint which gives more traction. It also softens the ride and makes things a little less bumpy. Sand, rock, water, mud.. These tyres just powered through. With most of the tough tracks done the rest of the trip was pretty easy. Lots of beautiful places to see, and never enough time to see it. After the OTT we got to the Jardine ferry, and set up camp at what was to be my favourite place of the trip; Loyalty Beach. Close to town, a very decent tavern at Bamaga, and jetty at Seisia where the kids and I spent most of the days fishing. We headed to Punsand Bay after a couple of days and walked to the very Tip of Australia. We even met up with a lovely couple from the Aussie Patrol Y62 FB page at the tip. After doing the tip, and 5 beaches, we decided to go back to Loyalty Beach for another couple of nights as Punsand Bay didn’t really have much else for us to do. Well besides catching some monsters off the beach. (Both of the big girls were let off to fight another day). After spending some relaxing time at Loyalty Beach it was time to head home. On the way back down, we did a quick detour back onto the OTT. We were not able to camp at Elliot Falls on the way up as it was booked out, so we stopped by on the way South. Kids took every opportunity to get into the water. There aren’t too many places that are croc, jellyfish and shark free up North. While Elliot Falls was lovely, we found Fruit Bat Falls a better swimming hole. Coming up to the event that nearly stopped me going on this holiday. AFL Grand Final!!! I certainly didn’t think I would have this issue when I began planning this adventure. I didn’t care about anything else. We just had to be somewhere that had a T.V, beer and the AFL on. Bramwell Station was to be my saviour. And as we filled up at Bramwell Junction, we met up with another group of travellers and another Aussie Patrol Y62 follower, Warren. Meet and greets done, we took off down the road to the roadhouse where we booked in and I set myself up in front of the T.V. Could it really be.. 37 Years.. I was as old as my little girl the last time I had seen my team in a Grand Final. What a great feeling… GO TIGERS!!! We packed up and left early the next morning and headed back to Cooktown, and from there visited Elim Beach. Now this was a magnificent place to stay. Although, all the shade from the massive trees made it challenging to keep the batteries charged. I had to constantly chase the sun and move the solar panels around. No power here. Another reminder of how important tyre pressure is. While this was a quick recovery, running 38 psi on soft sand at walking pace generally doesn’t end well. While camped at Elim, we took a trip to Cape Bedford. While the scenery was spectacular, so were the bushstripes and scratches on both vehicles. The track there was severely overgrown, and with no way of turning around once started, we ploughed through. Literally. After Elim Beach, we stayed at Cooktown for a couple of days to rest before the drive home. The trip back was uneventful, tiring and we were all happy to finally get home. I’m glad I didn’t have to go straight back to work, as cleaning up after a trip like this was taxing, and a few days of just relaxing before work was well and truly needed. The G003’s where not the first 35x12.5xR17 Mud Terrain (MT) tyre that I have had on my vehicle for off-roading. I have always generally run a more highway biased tyre for daily commuting and beach fun, and a separate set of wheels with MT’s for off-roading. The Yokohama’s are more aggressive, then my previous tyre. So you could understand my surprise when they weren’t any noisier. They handled about the same, wider tyres, higher sidewalls make for more roll when cornering. However the G003’s handle the road much better and I felt confident in cornering and stopping in dry weather. In the wet, they were very good. (Compared to other MT’s I’ve driven on.) The GO15s are much quieter, handle better, and have much more control of the road in all conditions. I have always believed that a 80/20 (general AT tyre) or a full H/T (Highway Tyre) is the only option for daily driving. And while the G003’s are great for an MT tyre on the road, they simply are not designed to be driven on the road all the time. I drove around on the G003 for 3 months around town, on the beach and a couple of weekend trips, and a trip to the Gold Coast from Rockhampton. Approx. 2,500kms travelled. I was confident in the tyres integrity and performance the whole time, but of course had to adjust my driving for wet conditions. Again, Yokohama have impressed me. The new G003’s are simply awesome. Trips to the Cape, Victorian high country, rocky, dirty, muddy tracks is what these tyres are built for. Their aggressive tread means they grab the track well, clean the mud out quickly and the rubber is soft enough to flex and bend and grab every bit of purchase available. With no chunking, no excessive wear or tears. No punctures or tyres popping of the rims, I can safely recommend the G003 for any track you throw your 4x4 at. With over 8,000kms travelled on the G003’s, on bitumen, dirt, corrugations, rocks, mud, sand, I have nearly 2mm wear on the tyres. They started with 17mm of tread. And still have over 15mm. This wraps up my latest review for Yokohama, on their latest G003 off-road tyre. And I give it a massive thumbs up. I hope you enjoyed my story, and my adventures and look forward to sharing more in the future. If you would like to see more pics, and videos, please visit the Y62 Clubs official website. So until then, I hope you all get out and enjoy your 4x4s, and use them for what they were built for… Adventures.